The identities of thirteen Egyptian migrants whose bodies were found in Libya were revealed Friday night. Ahmed Al-Mismari, spokesperson for the Libyan National Army, published to his Facebook photos of their passports. “Military patrols discovered the bodies in southwestern Tubruk,” Al-Mismari said. 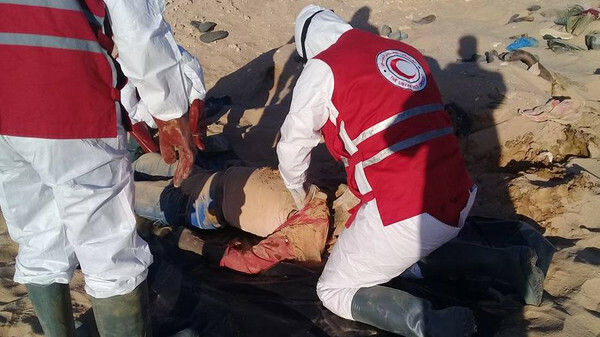 Arab media websites cited a statement by the Libyan Red Crescent that, together with security forces, they retrieved on Thursday the 13 bodies from Al Jaghbub Oasis of southern Tubruk and buried them in the desert. Media reports said the bodies were decomposed. Many of the deceased migrants were young peasants who came from Minya, according to published photos of their passports and national IDs. The incident was first reported by Al-Mismary on Tuesday, where an initial number of 16 bodies were discovered, seconding the discovery of dozens of Egyptian migrants’ bodies in the Libyan desert two months ago. Unusually, the Egyptian Foreign Affairs Ministry has remained silent on both instances. Back in July, relatives of the deceased voiced their inability to retrieve the bodies or to obtain details on what happened. The ministry had repeatedly warned Egyptians against traveling to Libya over the past three years, citing dangerous circumstances, which also included kidnappings and murders, but migrants continue to illegally attempt to cross into Libya.